This event is being organised by a local committee of musicians and jazz fans. Our aim is to promote jazz on the Isle of Wight. Members of the committee will not receive any financial reward. Inspected accounts will be made available on request. The committee will cover the cost of the main venues and headline acts. This will be funded by sponsorship, ticket sales and other fund-raising activities. Any subsequent profits will go towards funding future events. We will encourage other performances during the period. However, we will not act as agents. It will be the responsibility of the performers and venues to negotiate between themselves. On Wednesday 30th & Thursday 31st May we will be holding a jazz tuition course. It will take place at Strings music bar/venue in Newport from 10am to 3pm both days. 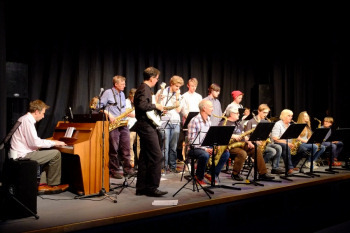 Tuiton will be provided by leading jazz musicians including Nick Page (guitar) and Gary Plumley (saxophone). The climax of the course will be a concert for which the tutors will provide pracice and perfomance tips. Instumentalist should be equivalent to grade 5 or above. Please bring your instruments (drums and keyboards will be provided).